The active ingredient in this granular chemical is Sodium Bicarbonate. It is used to raise the alkalinity level in your swimming pool or spa. Helps also to control your pH and chlorine levels. Dosage rates vary based upon swimming pool volume and current alkalinity level. 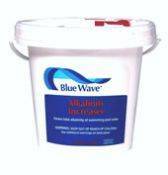 2 pounds will raise the alkalinity level in 10,000 gallons approximately 10 ppm. It is time to add alkalinity increaser when the ppm drops below 80.